“African Cosmos” includes this untitled acrylic on canvas by Gavin Jantjes from the National Museum of African Art, Smithsonian Institution. Photo by Franko Khoury. African cultural astronomy and how it has influenced traditional and contemporary African arts is the star of the Michael C. Carlos Museum’s new exhibition, "African Cosmos: Stellar Arts," opening Jan. 31 and on display through June 21. It is the Carlos Museum’s first major exhibition exploring the historical legacy of Africa's contributions to the science and practice of astronomy. The approximately 80 works from across the continent will also enlighten the ways in which observations of the heavens help inform origin stories, artistic expression and ritual practice in African cultures from ancient Egypt to contemporary South Africa. "This exhibition creates a dialogue among ancient, traditional, and contemporary African art by considering the ways in which different cultures visually construct their relationship to the cosmos," says Amanda Hellman, curator of African art for the Carlos. "The works included in ‘African Cosmos’ show the intersection between the extended observation of the sky and the construction of creation stories." Hellman notes that one of her favorite works that will be on view is Marcus Neustetter’s "Chasing Light." South African artist Neustetter, who will visit Emory as an artist-in-residence March 16-22, "creates his own aurora borealis," she says. "A headrest with twin figures by the Luba from the Democratic Republic of the Congo refers to the moon as a metaphor for heightened awareness; and an ancient Egyptian winged scarab made of faience suggests the sun’s path across the sky," Hellman adds, describing other works to be exhibited. Several works from the Carlos’ own collection will be exhibited, including Dogon Kanaga Mask, Egyptian Winged Scarab and Mambila shrine screen. "The exhibition's significance is that it creates an important dialogue among ancient, traditional, and contemporary African art," Hellman says. 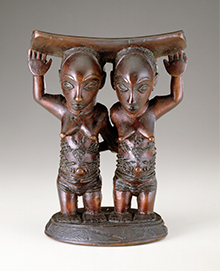 “African Cosmos” includes this 19th century headrest from the Democratic Republic of Congo. National Museum of African Art, Smithsonian Institution, museum purchase. Photo by Franko Khoury. The Emory Planetarium will play a key role in "African Cosmos." Programs developed in conjunction with the exhibition will look at cosmic events and artists’ inspirations from moon phases, sun movements and the stars. On Wednesday, March 4, a lecture on "Moonwatching in Africa and the Americas" with Anthony Aveni, a professor of astronomy and anthropology at Colgate University, will be held at the planetarium. Emory astrophysicist Erin Bonning will present a program on April 19 that she developed for the planetarium, followed by a gallery tour with Hellman and Rachel Kreiter, PhD candidate in the art history department. Registration is required by calling 404-727-6118. The planetarium will also be the location for an AntiquiTEA event on March 19, when Neustetter will discuss his "Chasing Light" which will be projected on the planetarium’s dome. • Feb. 5: Annie Shanley, PhD candidate in art history, discusses Sopdet, an Egyptian goddess representing Sirius, the dog star. • Feb. 19: Rachel P. Kreiter, PhD candidate in art history, discusses the ancient Egyptian conceptualization of the coffin as a representation of the cosmos. • April 9: Susan Gagliardi, assistant professor in the Art History Department, discusses Yoruba conceptions of the universe through a wooden example in the exhibition. • April 30: Beginning with the Carlos Museum’s recently conserved Kanaga mask, exhibited in "African Cosmos," Amanda Hellman, curator of African art at the Carlos Museum, will explore Dogon myths, their understanding of Sirius, the brightest star and the controversy surrounding their history. All AntiquiTEA programs are at 4 p.m. in the Carlos’ Reception Hall with the exception of the Neustetter’s on March 19. • A lecture by Christine Mullen Kreamer, curator of African Cosmos: Stellar Arts on Tuesday, Feb. 3, at 7:30 p.m. in the Carlos Reception Hall. She will describe the historical legacy of African cultural astronomy and its intersection with both traditional and contemporary African arts. Kreamer is deputy director and chief curator at the Smithsonian Institution’s National Museum of African Art. • An interactive art event, "Creating Dogon Cloud Catchers" will be Saturday, Feb. 28, beginning at 10 a.m. at the Carlos loading dock and in the African Cosmos exhibit. Blacksmith Jason Smith of Smithworks Iron and Design will work with people of all ages to create "cloud-catchers" on his portable forge. Dogon mythology says the blacksmith stole fire from the sun to heat his forge and create iron "cloud-catchers" to bring the rain. Docent-guided tours of African Cosmos will also be offered Feb. 28 on the hour beginning at 10 a.m. The event is free to Carlos Museum members; $10 for non-members. Register for time at the forge by calling 404-727-0519. • "Heaven’s Things in San Art and Folklore," a lecture by Jessica Stephenson, assistant professor of art history at Kennesaw State University, will be Tuesday, March 31, 7:30 p.m. in the Carlos Reception Hall. 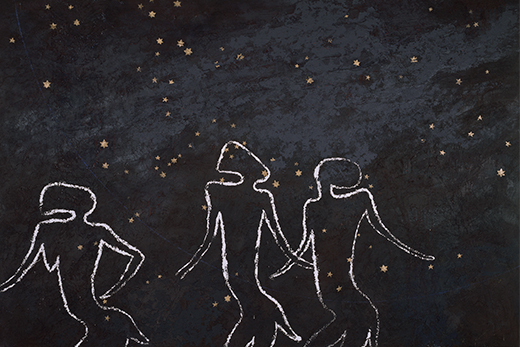 Stephenson’s presentation will bring together the expressive forms of myth and art to explore beliefs about the moon, stars, sun, and astral events from the San communities of South Africa and Botswana. Tours, events and activities for children and families related to "African Cosmos" are also planned. For more information, see the Carlos Museum calendar.